1) I got rear ended in the rain by a two door hatchback. Luckly, I was in Paul’s big truck, no injuries, no damage to the truck. The hatchback is another story. Quite possibly totaled. About 2 feet of the front of the car fits underneath the back end of the truck. Even the cop was impressed at the amount of damage the car had when I sustained none. Well, probably not impressed. More likely he was just trying to calm me down. 2) serious rain here in the Philadelphia area. The window wells filled up and caused the basement walls to look a bit like waterfalls for a few hours yesterday. Deep puddles in the basement and 6 inches of water pooled around the backdoor. I spent a while in the rain digging ditches to get the water to run down the driveway and carrying wet towels out of the basement. Mumbling the whole time about how we should rent and telling the neighbor I couldn’t just leave it for Paul to do when he comes home, that is another 2 weeks… sigh. 3) suffering an addiction to scrabulous on facebook. I found friends from high school and college and engaging them in friendly competition. Totally addicted. If you have a couple extra hours in each day, sign up! 4) got my passport renewed. I paid for expedited, sent it on a tuesday, got it back exactly one week later! Miracle! 5) got a haircut at a real salon. I think I must be a grownup now. No more $10 haircuts for me, this one is awesome and makes me wonder what I was thinking before? 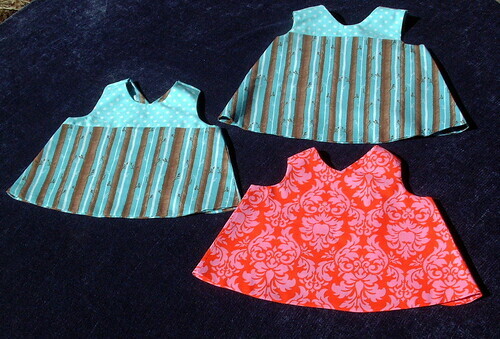 Even with my new scrabulous addiction on facebook I managed to make some more baby dresses. 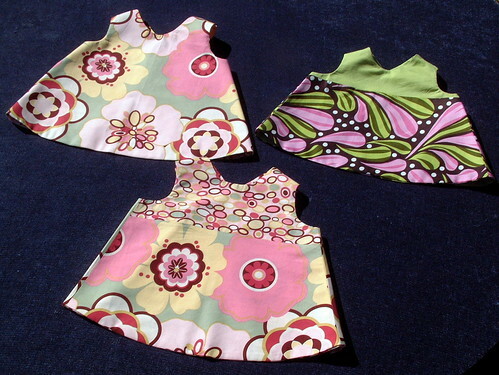 I am a little discuraged by etsy these days. Maybe it is really paypal that is discouraging. Somehow, with everyone taking their cut I end up losing 20% of the price of the item. So, off to the maternal wellness center with these. Yes it makes me less money but at least the fees are going to a good cause, not lining the pockets of CEO’s . Oh! and I am teaching a new class! 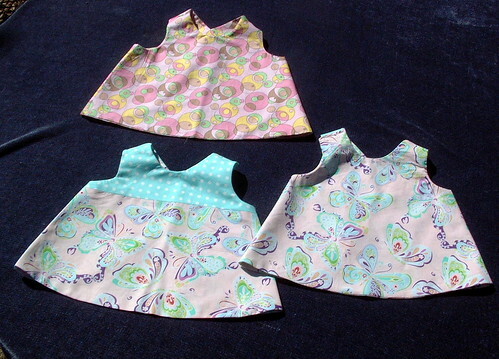 Baby dresses at the Cloth and Bobbin in Narberth on April 26th!